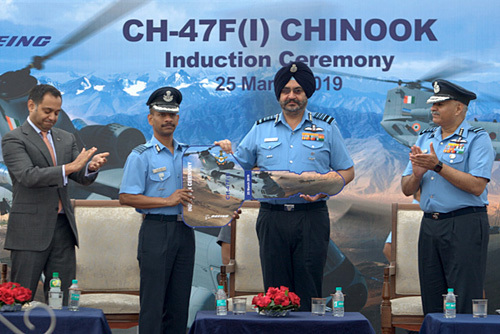 Deputy Chief of the Air Staff and Air Officer Commanding-in-Chief, Central Air Command, IAF. The suicidal attack on a CRPF bus in Pulwama on February 14, 2019 agitated the entire nation that sought retribution against Jaish-e-Mohammed (JeM), a Pakistan-based terror outfit, for the this dastardly act. Intelligence reports indicated that the JeM was training fedayeen for more attacks in India. For the first time, India decided to launch a non-military, pre-emptive air strike against JeM training camp in Balakot, Pakistan. Terror groups in Pakistan function under the Pakistan Army with government patronage. Pakistan often warns that attack on terrorists on its soil will be construed an attack on Pakistan and it often resorts to nuclear sabre rattling to desist India from taking action against their terror groups. India has always exercised restraint and rarely exploited the military option against proxy war by Pakistan. The decision to launch an air strike this time was a strategic change in India’s resolve to fight terror from Pakistan. The Indian Air Force (IAF) was tasked to eliminate maximum number of terrorists at the JeM training camp with minimal collateral damage. Based on intelligence and high-resolution imagery, the IAF decided what to strike and what not to strike at Balakot. 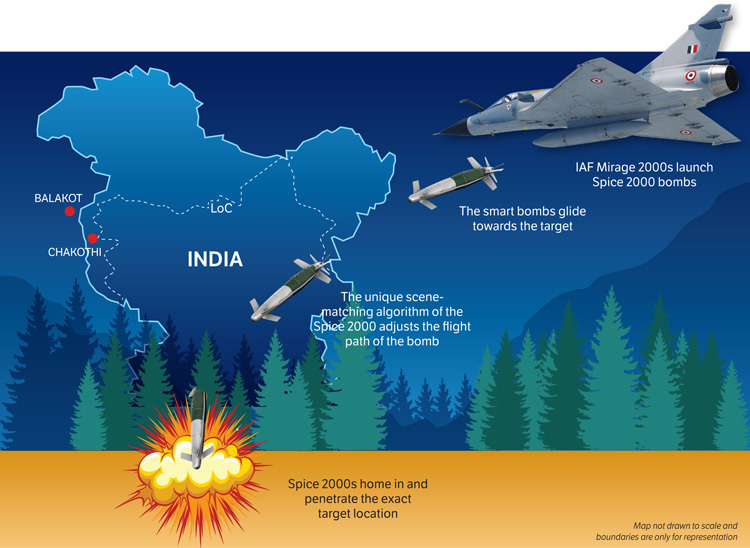 The Spice 2000, a smart, precision and penetrative bomb was chosen to eliminate terrorists. The Spice 2000 incorporates jam-resistant GPS guidance coupled with digital scene correlation and picture matching for accuracy better than three metres. It weighs 2000 pounds and its steel body can penetrate 3-meter thick reinforced concrete. It enters buildings through 50-60 cm pin-hole and explodes as per pre-set time-delay at the desired point in the building. Blast from the bomb’s 90 kg explosive kills all human beings within the room without much collateral damage. The attack was timed at 0330 IST (0300 Local Time) as all terrorists would be asleep at this early morning hour. 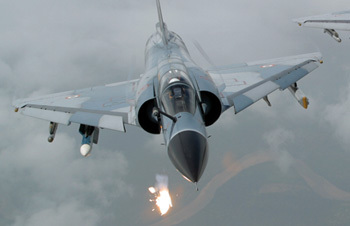 To surprise the Pakistan Air Force (PAF) and give minimum reaction time, 12 Mirage 2000, including six in strike configuration, took off from central India on February 26, 2019 and routed along the Himalayas for terrain masking to prevent radar detection. The mission was integrated with other IAF assets through indigenously developed Integrated Air Command & Control System (IACCS) and was provided Air Defence cover by AWACS, indigenously developed AEW&C and Su-30MKI. Flight Refuelling Aircraft (FRA) provided air-to-air refuelling, so crucial for such missions. The PAF scrambled few F-16 interceptors who overwhelmed by the threat, withdrew without engaging IAF fighters. Post-mission ‘Bomb Damage Assessment’ revealed that buildings had been hit as planned and it was unlikely that any terrorist in the targeted buildings would have survived. India did not announce the air strike. On February 26 at 0512, Pakistan military spokesperson was first to tweet “Indian Air Force violated Line of Control. Pakistan Air Force immediately scrambled. Indian aircraft gone back. Details to follow”. Later Pakistan took few journalists to a place of their choice and showed few fallen trees as result of air strike. Some foreign media doubted air strike result through satellite imagery of 1-3 metres resolution. Few self-styled experts wrongly publicised that the Spice 2000 was ‘Guidance Kit’ fitted on Mk 83 (453 kg) or Mk 84 (907 kg) bombs, therefore, such heavy bombs should damage buildings. Some Indians even sought evidence in terms of body count. Contrary to common belief, air strike with the right weapon can kill all people inside without damaging the building. The Spice-2000 is designed to explode after entering buildings. Its 50-60cm pin-hole entry can only be detected by imagery of 30cm or better resolution obtained from military satellites. The Spice 2000 bomb weighs 2,000 pounds, but carries only 200 pounds of explosive, sufficient for blast to kill all in room. High resolution imagery clearly shows bomb entry pin-holes, burn marks on edges of targeted buildings and nearby large area freshly dug up for mass graves. Most Indian TV channels have streamed details and results of air strike after Air Headquarters showed them high resolution images. Social media messages amongst Balakot locals bring out heavy devastation at JeM training camp.Viral audio of Ammar, JeM chief Masood Azhar’s younger brother, confirms and condemns IAF’s air strikes over the training camp. Pakistan has not allowed any local/international journalist and local population to visit JeM training camp till date to conceal the damage. Technical intelligence had confirmed the presence of nearly 300 mobile phones pre-strike that vanished post-strike. Based on hit accuracy achieved and capabilities of the Spice 2000 it is unlikely that any JeM terrorists sleeping in those buildings would have escaped. India struck terrorist camp with no damage to civil and military personnel or assets. Pakistan had declared that air strike had only uprooted few trees. Pakistan retaliated the very next day only to avenge huge loss suffered by their terror establishment and to show solidarity with them. The IAF detected 24 PAF fighters and scrambled MiG-21 Bison, Su-30MKI and Mirage 2000 interceptors, which engaged and forced Pakistani aircraft to turn back. In this process, the PAF dropped three bombs which failed to hit their targets. The IAF successfully foiled Pakistan’s attempt to strike back at India. Wing Commander Abhinandan Varthaman (known as Abhi in the IAF) had scrambled in MiG-21 Bison from Srinagar and was closest to the F-16s. Having picked them up on radar, he manoeuvred to lock on the enemy F-16 and launch the R-73 missile which hit his target. During subsequent manoeuvring in the ensuing air combat, Abhi’s aircraft was hit compelling him to eject. Electronic surveillance by AWACS had identified the aircraft shot by Abhi as F-16. Number of PAF aircraft detected on radar was one less while returning. PAF radio transcript reveals that the F-16 directed to go ‘HOT’ on Abhi, never transmitted on radio even during return of PAF aircraft. Army units had reported two to three parachutes which the social media videos also showed. India has parts of AMRAAM carried only by PAF F-16. Abhi had shot down a two-seater F-16. Both F-16 and Abhi’s MiG-21 crashed in PoK. The, locals assumed all three ejected pilots as Indians and manhandled them before the Pak Army’s arrival. Abhi’s attempt to escape delayed his capture by locals for almost 45 minutes, which minimised time with locals before Pak Army’s take over. F-16 pilots did not attempt to escape and got badly injured due to mob frenzy before being rescued by the Pak Army. One F-16 pilot succumbed to injuries in hospital. For few hours, the Pak military spokesperson reported loss of F-16 and its pilots as Indian losses, which he later corrected. Using F-16 to strike India violates terms of sale by the United States to Pakistan. As usual, despite hard evidence, Pakistan vehemently denies using the F-16. Pakistan also refuses to acknowledge the death of their pilot who laid down his life for their country. Soon videos of Abhi in captivity of locals followed by his take over by the Pak Army, emerged on social media. Shortly after, the Prime Minister of Pakistan and military spokesperson announced Abhi’s capture. India succeeded in getting Abhi released on March 01, 2019 and he returned home to hero’s welcome while crossing Wagah-Atari border at 2120 hours, after almost 60 hours in captivity. Abhi created history by shooting down an F-16, the most potent and advanced fighter in the PAF, by his MiG-21 Bison, the oldest aircraft in IAF’s inventory. The aerial engagement and shooting down of the F-16, truly reflects Abhi’s excellent training and outstanding professionalism. After ejection, as a true air warrior, he put in best efforts to deny his captors access to classified information carried on him during sortie. Further, Abhi impressed the entire world with numerous videos on social media streaming his legendary display of courage, determination, motivation and patriotism while in captivity. Abhi has made India and the IAF very proud. He has become an inspiration for young Indians and an example to emulate. As Balakot proved the efficacy of air strikes against terrorists, the Government will now be under increased pressure to launch more air strikes to avenge terror attacks. Credit must go to the bold decision by Prime Minister Modi, contribution of intelligence agencies, good leadership of the IAF and the outstanding professionalism of air warriors. Excellent effort by the Ministry of External Affairs ensured that most nations supported the air strike and none except Pakistan opposed it. In future, India may execute more air strikes against terror outfits in Pakistan based on credible intelligence. To deter Pakistan from retaliating/escalating after such air strikes, the IAF’s numerical superiority needs to be restored expeditiously by arresting depleting numbers of fighter aircraft and fast-tracking procurement of six additional FRA. The entire nation was anxious to know facts about Balakot air strike and the aerial engagement the following day. However, delayed official information led TV channels and social media to rely on hearsay information and fake news fed by Pakistan. The nation looks forward to real-time release of official information to the media during such high-pressure situations.